As mobile-friendly specialists, we applaud the initiative to make the web a better experience for Smartphone users. The issue we have is whether this will once again skew search results in favour of larger organisations, who have been able to address the issue already. 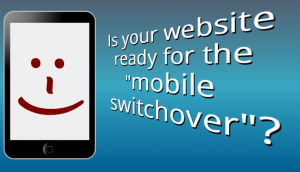 Fear not – good citizens of the world – we can help you make the transition to having a mobile-friendly experience in a shorter timescale, and at probably a far lower cost, than you might have thought. And for those of you who are interested, we can put our placeholder “starter for 10” into your site to get you on the road to being fully mobile optimised in under an hour.